The Baby and His Chi's Are Moving! There's been a lot going on at our home lately, and it's [past] due time for an update about us! Jer started a new job mid-March and it's still going great! We've had some bad mold in our apartment and fluctuating rent, so we've decided against the newly opened 2-bedroom and decided to move all-together. We're moving back into a town-home, in the next town over (big move, right?). Buggie will have his own room, though it will probably just have his toys, and I think his crib will still be in our room. 2 bathrooms instead of our current 1. Detached garage, laundry hook-ups, and (drum-roll please....) a DISHWASHER!!! Yes folks, my biggest selling point lol! I despise washing dishes, almost as much as I hate cooking. The big move will be taking place the weekend of April 27th. Along with spending the last days until the 1st cleaning our apartment so we *hopefully* get all of our security deposit back. Now for some sad news that is even more past due... We also re-homed our beloved chihuahua, Jack, last month. With his separation anxiety, tiny 7 pound body, and Bug being the rough'n'tumble boy toddler that he is, we decided with a very heavy heart that it was the best thing for him. We've still having a hard time dealing, but we know he's much happier in his new home. Venus had a rough time at first, but she almost seems like a better dog being the only dog now. I think she thrives on the extra attention. With all these things going on, I've still got a few reviews and giveaway's in the mix, so please remember to check back often, and check out the current giveaways on the left sidebar if you haven't already! If you're a follower of many different cloth diapering clogs as I am, you may have heard of Ecobubs before. Ecobubs is well known for their beautiful wool-blend pockets, which is the reason I had reached out to them. 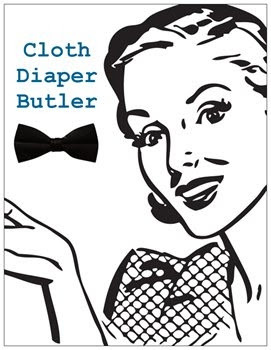 However, instead of reviewing a pocket diaper, I was given the opportunity to try out a brand new product that they just recently released: the Cloth Diaper Butler! Grin Unlimited, the distributor of Ecobubs, has a site specially dedicated to the butler, though it is offered though the Ecobubs website as well. I immediately thought upon opening my package that this would be a very handy product to have along with our diaper sprayer. I simply clip the top of the diaper and let it soak inside-down in the toilet for about 5 or 10 minutes, then spray and hang by the handle in our tub to drain excess water. No more wringing! The really nice thing I've found out, is that the Cloth Diaper Butler also makes it easier to "dunk and swish" if you don't have a sprayer. No more sticking your hands in the toilet water and swirling the dirty diapers around. I've been soaking the diapers with the Butler, swishing with the handle, then simply hanging to drip-dry as well before tossing in the pail. Soaking alone with the help of the butler still removes large portions of waste and keeps your hands clean, and is so much cheaper than a diaper sprayer! 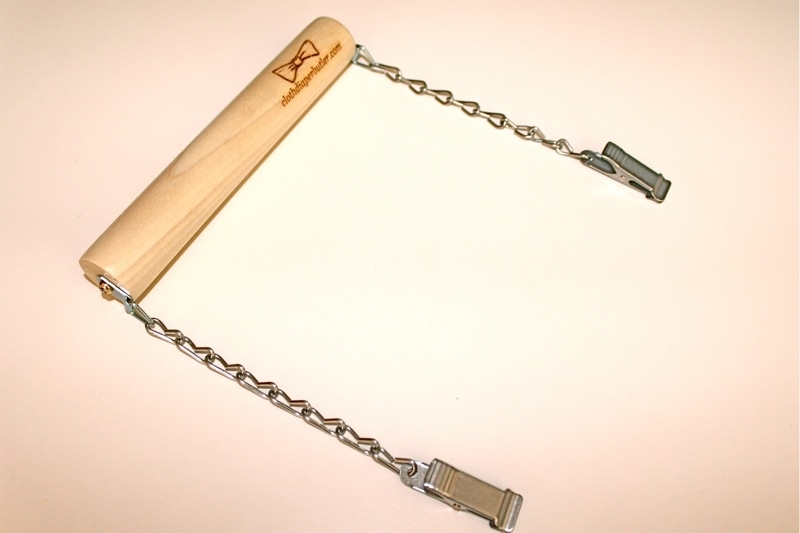 I have been so impressed with this handy tool, that I had to be sure I could offer one of them to my readers. Please enter using the Rafflecopter entry form below. DISCLAIMER: We were sent the product(s) mentioned in this post for review purposes only. We were not offered monetary compensation for review, and our opinion is 100% our own. Whether you have a toddler tossing around a sippy cup or a little one bringing supplies to school or out with them to play, you know how important it is to keep their things labeled! Lovable Labels is here for you with not just a label with a name, but completely customizable labels to fit all your needs from clothing to medical id's and school supplies! 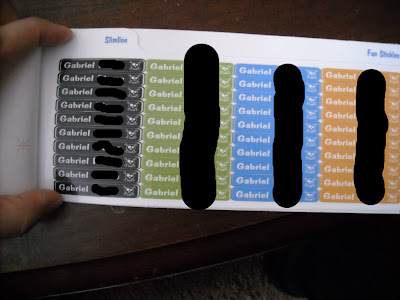 I was sent the Friendship Sampler to review and was very impressed with the variety of labels included. 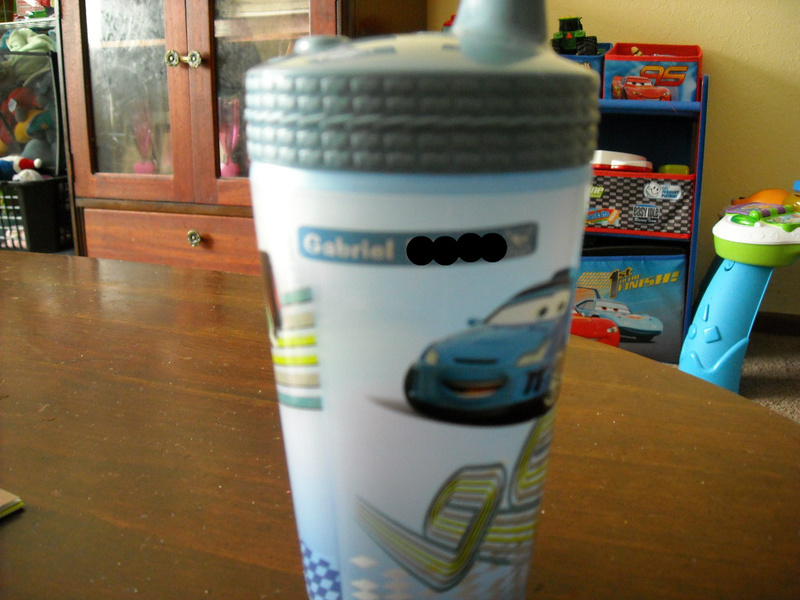 I tried them out for the most part on Bug's sippy cups. One of the star stickers was placed on his ride-on bug car, but I couldn't get a picture, it's out at the campground already! We tried these labels out for a couple months through the normal wear and tear of a toddler and then how they withstood regular cleaning. 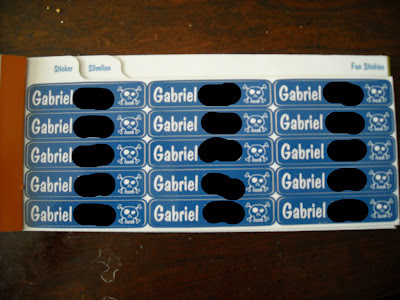 Obviously if the labels are places on a toy or book they aren't going to be ran through a sink or dishwasher daily, so they will probably see less wear and last longer. 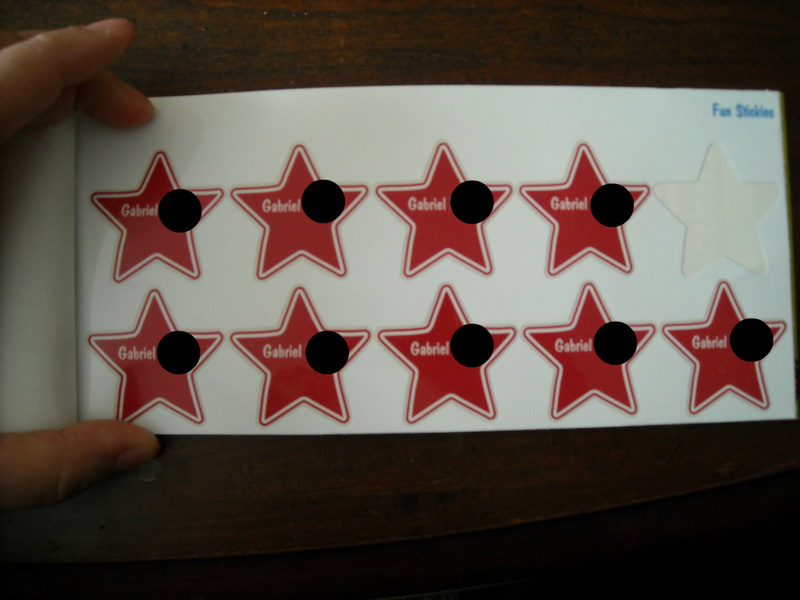 The Friendship Pack contained all "Multi-Purpose Labels" which are dishwasher safe, microwave safe, and UV resistant. However, after about 3 weeks of regularly being washed in the sink, you could notice water soaking under the top seal on the label. They still stick nice, with no sign of peeling off or coming loose, but it does make me a little curious as to how often (if at all) they might need to be replaced on food containers or cups. Along with multi-purpose labels, Lovable Labels also makes shoe labels, clothing labels, tags (for bags, backpacks, or luggage), household labels (home office, crafts, outdoor bins, spices, pantry, classroom, kosher, toy bins, cord tags and date tags for food), stationary labels, and safety products which include allergy and medical alerts, allergy symbols, medical and vital id wristbands and kid bands (in case your little one might get lost at a park or large public place). Since I began my review, the Friendship Sampler Pack has been discontinued. However, Lovable Labels would like to offer you all the chance to win an Ultimate Camp Pack! The Ultimate Camp Pack includes the same styles of labels I was able to review, but also includes clothing and shoe labels and tags! Please enter using the Rafflecopter entry form below.